Sunday July 8th saw Knights sponsoring Llanfest 2018 – the ‘grand finale’ concert to close this year’s Llangollen International Musical Eisteddfod. The event concluded with headliners, Kaiser Chiefs putting on a high-energy show for fans following some other great main-stage perfomances from Hoosiers and Toploader. 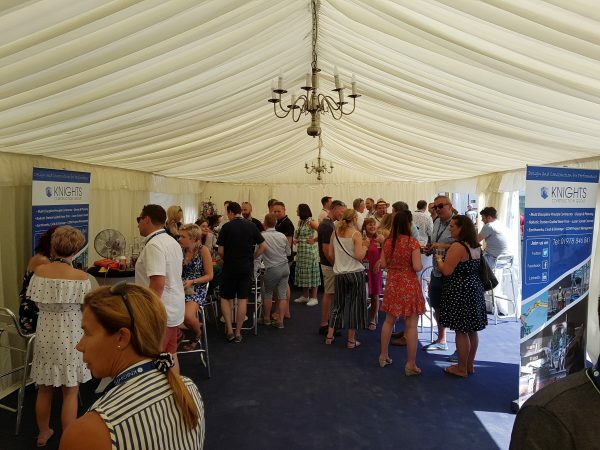 With doors opening at 2pm on what was a beautiful summer’s day, Knights staff welcomed around forty VIP guests into the Harmony marquee where delicious food and refreshments were provided courtesy of Tyn Dwr Hall and Wild Garlic Catering. Guests had the chance to take in the afternoon performances around the Eisteddfod grounds which included a diverse range of music from performers such as The Cavern Club Liverpool, Destination and the talented Lucy Mayhew amongst others. By the time the Pavilion opened its doors for the evening’s main-stage event, our guests – armed with complimentary front-row tickets were all set to enjoy what was a fantastic night of music.